"The performance of the Impromptus, D.899, heard here, confirms Curzon's place as one of the great Schubert players of his generation. Indeed, the audience was so impressed that they couldn't help applauding between each Impromptu. Not only does Curzon manage to play with a range of emotion, from limpid tenderness to controlled aggression, but his attention to the sound he produces from the piano never fails to impress. This was one of Curzon's most salient attributes; for him the sound he made at the keyboard was paramount and it is his combination of cerebral interpretation, no doubt acquired in part from two years study with Artur Schnabel, coupled with his acute attention to sound, that made Curzon such a unique pianist. Listening to the first Impromptu one can hear that it is not just the beauty of sound that Curzon is concerned with, but the balance between the hands, parts and voices, and the way the harmony of the left hand supports Schubert's glorious melodies. 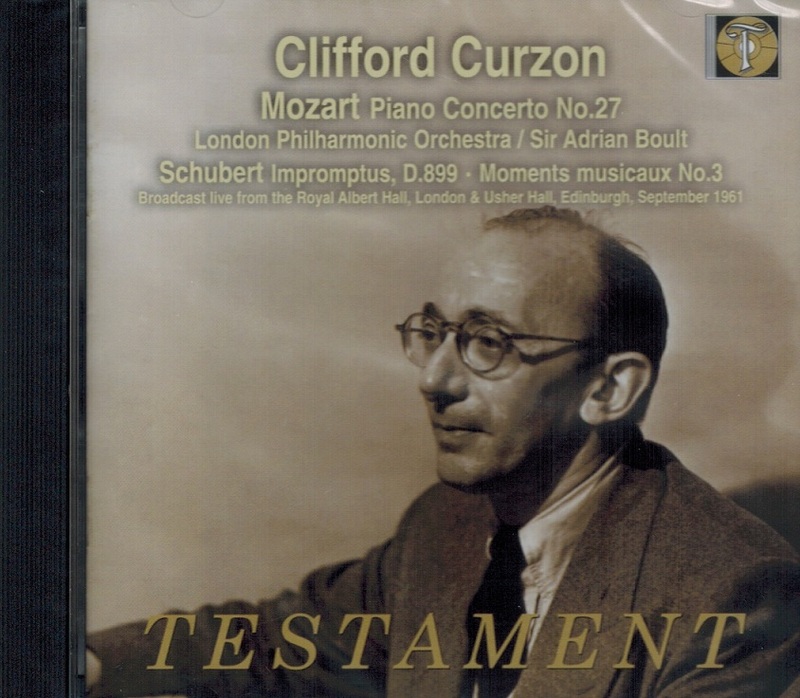 Indeed, it is good to have Curzon in a live performance of this work as, although he recorded a short studio recital of works by Liszt and Schubert for the BBC in December 1961, he omitted the first and most substantial Impromptu playing only the last three. One of the highlights of the 1961 Edinburgh Festival was Curzon's performance of Mozart's last Piano Concerto, K.595 in B flat. 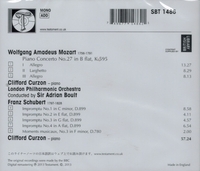 He later travelled to London to perform the work again at the Proms and it is this performance that is heard on this CD. 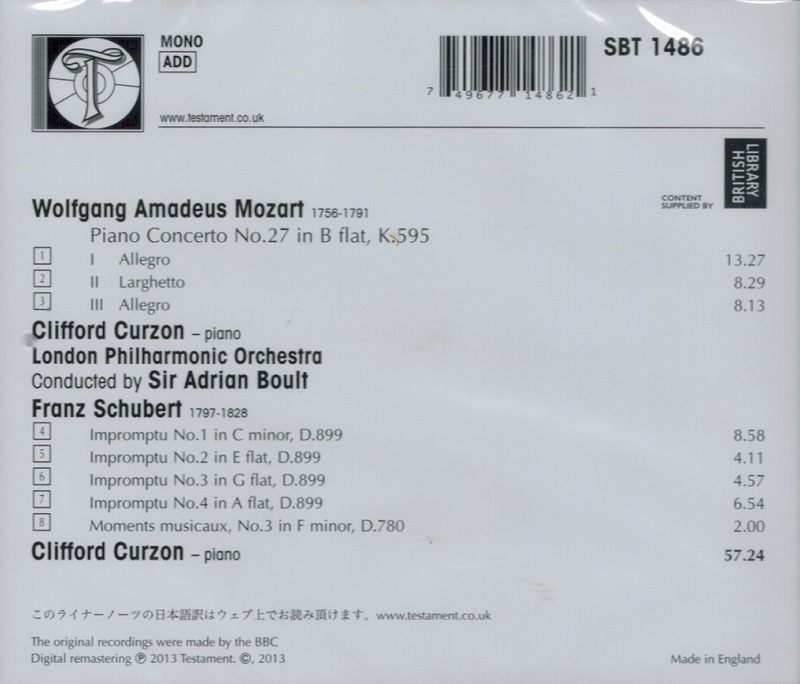 Curzon is supported by the London Philharmonic Orchestra with Sir Adrian Boult, who had not appeared at the Proms since 1958. The orchestral playing is at once smooth and elegant with string and wind playing beautifully shaped and phrased by the conductor, matching Curzon's style to perfection." "Sir Clifford Curzon, the world-renowned British pianist, was an immensely popular musical figure in Britain. Sir Clifford was knighted in 1977, recognition of a musical lifetime that made him, in the words of a tribute yesterday by the music critic of THE DAILY TELEGRAPH in London, 'the leading British pianist of his generation'. And as early as 1947, Noel Strauss of THE NEW YORK TIMES said that 'Curzon must be reckoned among the greatest keyboard artists of the time'. Clifford Curzon made his debut in the United States with a recital at Town Hall in New York City on Feb. 26, 1939. THE NEW YORK TIMES critic said that the performance established the 31-year-old pianist as 'an artist of prime importance, a supreme colorist with an impeccable virtuoso technique'. On that same first tour, he played three concertos with the New York Philharmonic under Alexander Smallens at Carnegie Hall, and THE TIMES hailed Mr. Curzon for his 'superior musicianship, polished technique and sure grasp of style'. One of Sir Clifford's last appearances in the United States was with the Philadelphia Orchestra under Eugene Ormandy on May 2, 1978. Harold C. Schonberg, then chief music critic of THE NEW YORK TIMES, wrote of the pianist's performance of Mozart's Piano Concerto #24 in c minor: 'The performance had logic, strength and integrity. The strength was manifest not in outsized dynamics but in the way a phrase uncoiled, inevitably finding its way into the total structure of the piece. This kind of tensile strength, so necessary in Mozart, is the secret of only a few living musicians'. Sir Clifford's repertory was both broad and eclectic. It included more than 50 concertos and ranged from early classics to contemporary works. While critics may have differed over his uniform command of this vast body of music, they generally agreed that few artists could match him in total performance and in the superbly high level of artistry he offered his listeners. Among his most enthusiastic American fans was Virgil Thomson, the composer and the longtime music critic of THE NEW YORK HERALD TRIBUNE. Mr. Thomson considered Mr. Curzon 'the most satisfactory interpreter' of the piano's Romantic repertory, and he once wrote that 'certainly no one brings to life Schubert and Schumann with quite the delicacy and the grandeur of Mr. Curzon'. And remarking on Mr. Curzon's performance of Beethoven's Fourth Piano Concerto with the Cleveland Orchestra under George Szell in February 1950, Mr. Thomson wrote that the pianist's 'tender grace and grand perspective of expression all made his rendering both a message and a monument'. Olin Downs, the late music critic for THE NEW YORK TIMES, wrote many laudatory notices of Mr. Curzon's performances, but he summed up his appreciation of his artistry in a review of a recital featuring the works of Mozart, Schubert and Schumann in Town Hall in January 1950: 'He is indeed a musician among musicians, whose sense of style is partly the result of his exceptional knowledge of his art, but is more the result of that intuition which far surpasses in its penetrating truthfulness any book learning or wise exercises that a healthy mind needs'. Mr. Curzon was born in London on May 18, 1907, the son of Michael Curzon, an antiques dealer, and the former Constance Young. Neither of them was a musician but both were music lovers and young Clifford began the serious study of the piano when he was 6 years old, after abandoning the violin. He chose the piano, he said later, 'because you can be alone with a piano'. The prodigiously talented student went on to train with Britain's leading teachers and later with the world's greatest masters, Artur Schnabel in Berlin and Wanda Landowska and Nadia Boulanger in Paris. He entered the Royal Academy of Music in London at the age of 12 and established himself as a star pupil by winning two scholarships and virtually all the prizes open to pianists. He made his first public appearance in London when he was 16, soon began teaching at the Royal Academy and was a full professor at 19. Mr. Curzon suspended his career as a concert artist in 1928 to study with Artur Schnabel in Berlin. While there, he met Lucille Wallace, a harpsichord student from Chicago. They were married in Paris in July 1931, and they often played duets and discussed the relative merits of the piano and the harpsichord in recital halls and on BBC programs. Mrs. Curzon died in 1977. Mr. Curzon toured the Continent with leading European orchestras in the 1930s and appeared at many British music festivals. After his debut in Town Hall in 1939, Mr. Curzon returned to the United States in 1948 and performed here frequently until 1970, both in recitals and under such conductors as Bruno Walter, George Szell, Eugene Ormandy and Mr. Smallens."